There’s something special about a coffee shop that no other type of business can quite master. It’s a retreat for creatives, a filling station for lighter fare longings, and a chat room for friends, family, and first dates. Come sate your caffeine cravings at one of these 10 wonderful coffee shops in South Carolina. For hot coffee with a cool vibe, hipsters and java junkies head down to Coffee Underground right off Greenville’s historic Main Street. This subterranean establishment serves up salads and sandwiches, appetizers and desserts, cocktails and coffee to fuel your day. And make sure you check out their weekly live theatre shows, complete with standup, improv, singers, songwriters, and poets. Fine dining, brilliant art, and succulent coffee make the Collector’s Cafe & Gallery a triple threat. Everything here is a work of art, including the food and beverages. It’s also the home of one of the largest art galleries in the Southeast. Fine dining, brilliant art, and succulent coffee make the Collector’s Cafe & Gallery a triple threat. Everything here is a work of art, including the food and beverages. It’s also the home of one of the largest art galleries in the Southeast. When wine lovers and coffee fanatics can’t agree on a place to fuel their addictions, they turn to Cork & Beans Wine and Coffee Bar. Settle into an artistically rustic environment complete with meat and cheese hors d'oeuvres, fresh salads, soups, quiche, and desserts. But if you don’t have time to sit and chill in house, you can order online and have it delivered. It doesn’t get any fresher than straight from the source. Little River Roasting takes quality very seriously, so much so that they have traveled to and personally vetted every co-op, farm, estate, and importer that supplies them—in over 20 countries! They take the time to make sure your daily pick-me-up comes from responsible, sustainable practices that never puts quality on the back burner. Yes, you’re that important to them! Just the name of this java house makes it worth a stop. 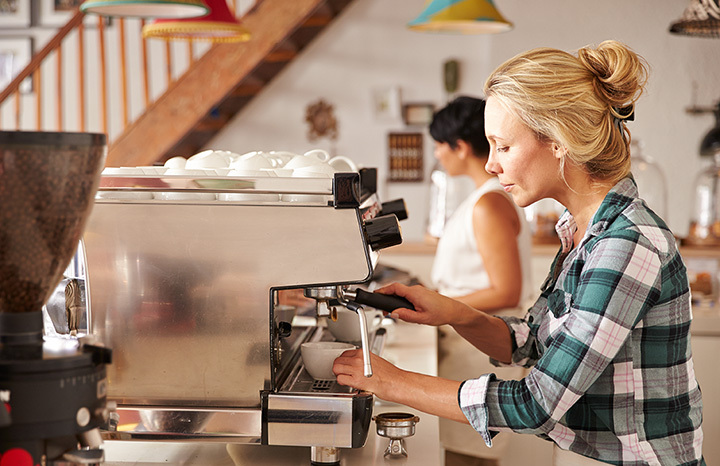 While you won’t find any hairless primate baristas behind the counter, you will find plenty of smooth, delicious coffee and other fabulous caffeinated concoctions. It’s a tried and true loved-by-locals hot spot, and locals always know best. Like any great coffee shop, you can grab a fresh hot brew to start your day in the morning and a cold craft beer to end it! There is no Wi-Fi at Kudu, so don’t plan to schedule a study session here. Kudu puts great emphasis on hanging out in their shop with friends, family, or a maybe a date, to have a nice conversation and socialize. The creativity in the name perfectly illustrates what you’ll find when you pass through their doors. Immaculate Consumption offers the cozy, trendy coffee house atmosphere nestled in downtown Columbia. They also feature a generous variety of lighter fare with unique flavors you won’t find just anywhere. Midnight Rooster Coffee House brings together coffee, cuisine, cocktails, and recreation all under one roof. Grab a fresh cup of joe complete with fancy latte art, or pull up a seat to a tasty breakfast, lunch, or dinner. It’s typical coffee house fare interspersed with some savory surprises. Bubble tea, anyone? If you want to tickle your taste buds, or just wanna sitta and have a cuppa, then Cuppa Manna is your coffee shop haven. They feature open mic nights, yummy treats, latte art, and the finest brews in town. What started as a small book-selling establishment has now grown over twofold, both in square footage and product offerings. The Booksmith serves up a tasty offering of cafe-style beverages, as well as gourmet chocolates, high end knickknacks, jewelry, books, magazines, and all the other intrigues you’d expect to find. It’s a unique place, plain and simple, and one worth paying a visit.